In this review we compare two affordable Bluetooth wireless speakers, which each cost $150. The smaller model is the TDK Life on Record Trek Max (model A34), which is portable, rugged and water-resistant. It can get splashed at the pool or beach, and is weatherized to endure a light rain shower, just don’t submerge it. 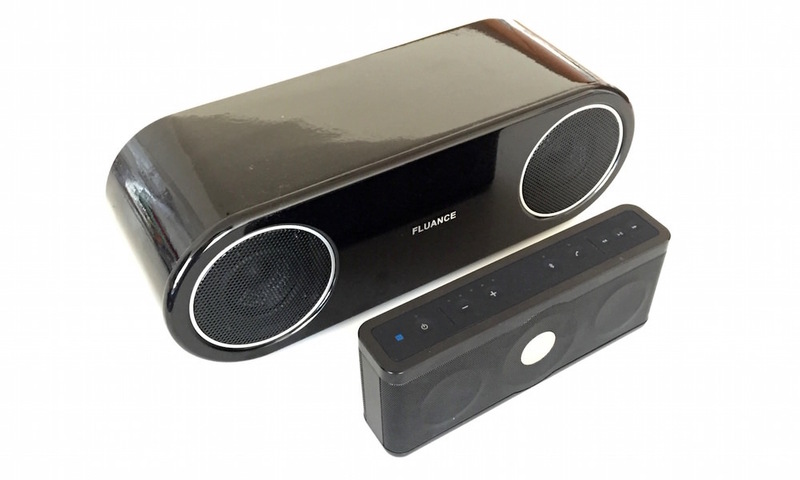 The bigger Fluance Fi30 is a wired, table-top Bluetooth speaker that will most likely sit in one place inside. So for starters, the Trek Max gives you more versatility for the money. At their price point both sound very good, but not the same. There are Bluetooth models for less money, but I have yet to hear any with enjoyable sound quality. The TDK Trek Max plays surprising loud, despite being smaller with boomier bass, which makes it fun for an impromptu dance party anywhere. The Fluance Fi30 has a more refined sound for in-home listening, and sounded better than I had expected. However, its listening sweetspot is not very wide. The Fi30 doesn’t spread sound equally across the room, so it only sounded best when seated directly in front of it. Whereas, the Trek Max has speaker drivers on both sides, which makes listening position irrelevant. The finish of the Fluance Fi30 screams audiophile quality. My test model was finished in high gloss piano black, but it also comes in all-white or white/bamboo (wood grain) for the same price. The speaker uses a high quality wooden cabinet design and feels well built. In other words, it doesn’t feel cheaply made, although the high gloss black is a dust and fingerprint attractor. The Trek Max looks less glamorous, but is well designed. It feels solid and is heavier than you’d expect. Functionality wise the Fluance Fi30 is as barebones as you can get, but that’s not necessarily bad. It actually makes things simpler, because all music controls are handled from a Bluetooth connected smartphone, tablet, or laptop. There is a power button and Bluetooth pairing button on back, and two inputs you’ll probably never use (3.5mm aux-in for wired connectivity and USB input for charging). The Trek Max has all of that plus track controls (play/pause, skip forward/reverse), up/down volume, and a built-in microphone for speakerphone capability. The play button on the Trek Max makes it especially easy to start playing music where you left of, if your speaker is nearby but your phone is in another room. Regarding connectivity, Bluetooth pairing and re-pairing was equally quick and painless. Upon turning each speaker on, my iPhone 6 discovered and connected very fast with a simple tap in iPhone > Bluetooth Settings. After the initial connection, each speaker will remember and sense when you’re in range and re-connect automatically. Trek Max beeps to notify you’re connected and the Fi30 generates a swoop sound upon reconnection. The Fluance Fi30 has an interesting quirk, since it’s always plugged in and looking to reconnect. I’d hear the swoop sound every time I returned home. The good news is you know you’re connected, but the sound can get annoying over time. Another thing I noticed if you happen to be listening to music on headphones when you return home, the music will instantly jump to stream from the Fluance Fi30 when in range. The Fi30 actually stole the connection from the wireless headphones I was using. Again, a positive or negative depending on your preference. Techno geeks may want to know the Trek Max adds NFC, while the Fi30 has APT-X streaming capability from devices that support it. The Trek Max has auto power off after 20 minutes and an 8 hour battery, while the Fi30 will usually stay powered on and be ready to play. As mentioned above, that is good for convenience sake but potentially a nuisance. I enjoyed both speakers and would recommend either. 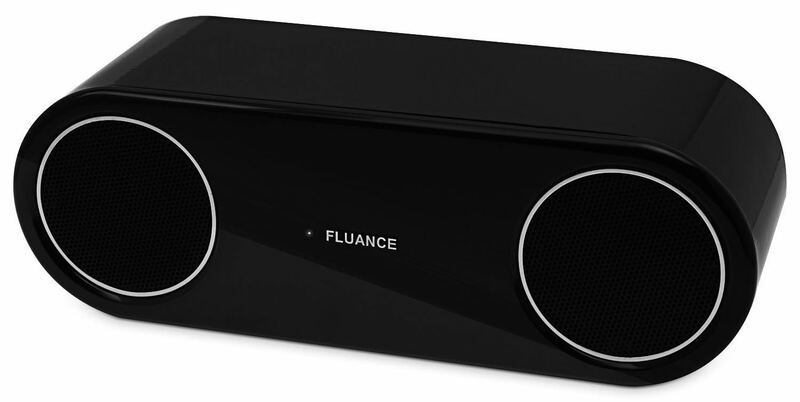 If you don’t care about portability and want a wireless speaker that both looks and sounds good that is also very easy to use, go with the Fluance Fi30. But if you want the extra features, functionality and portability along with greater room filling sound buy the Trek Max. I found myself using the Trek Max more, because I could carry it to any room of the house. So, if you can’t decide, get the TDK Trek Max — you won’t be disappointed.